Ahoy Mateys! Calling all Pirates! 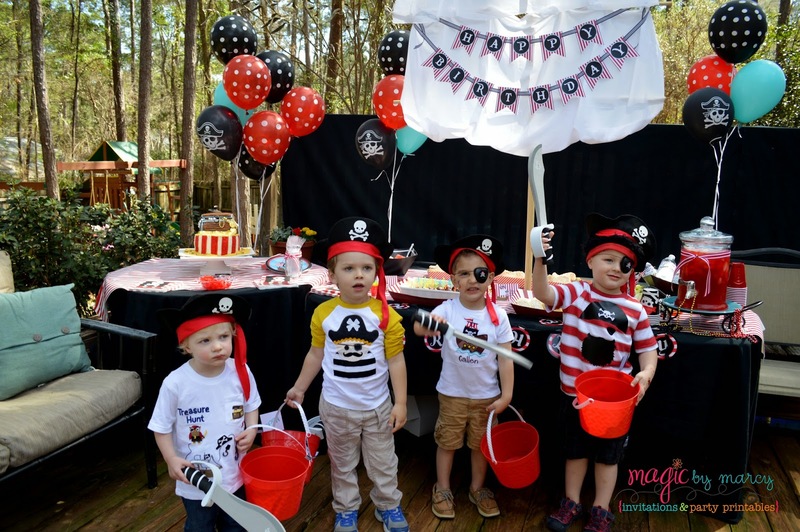 My son is into everything pirate, so when it came to his 3rd birthday party it was no surprise when he said he wanted a Pirate party for his Birthday. 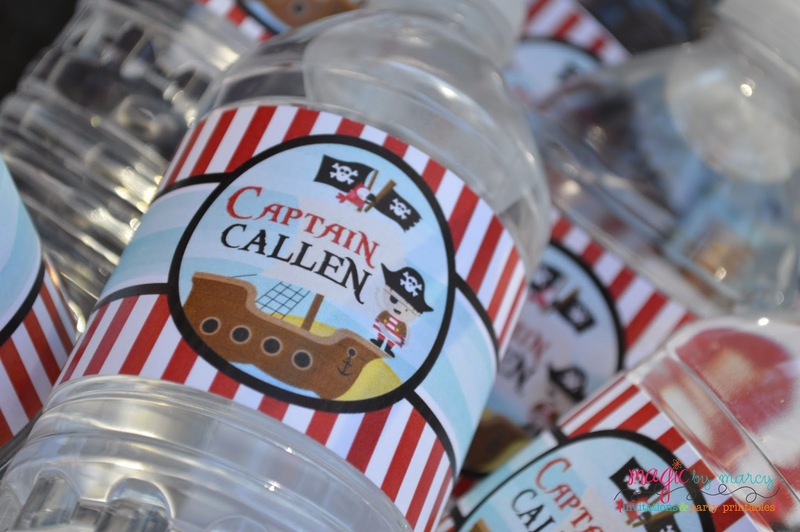 Check out some of the Pirate fun! 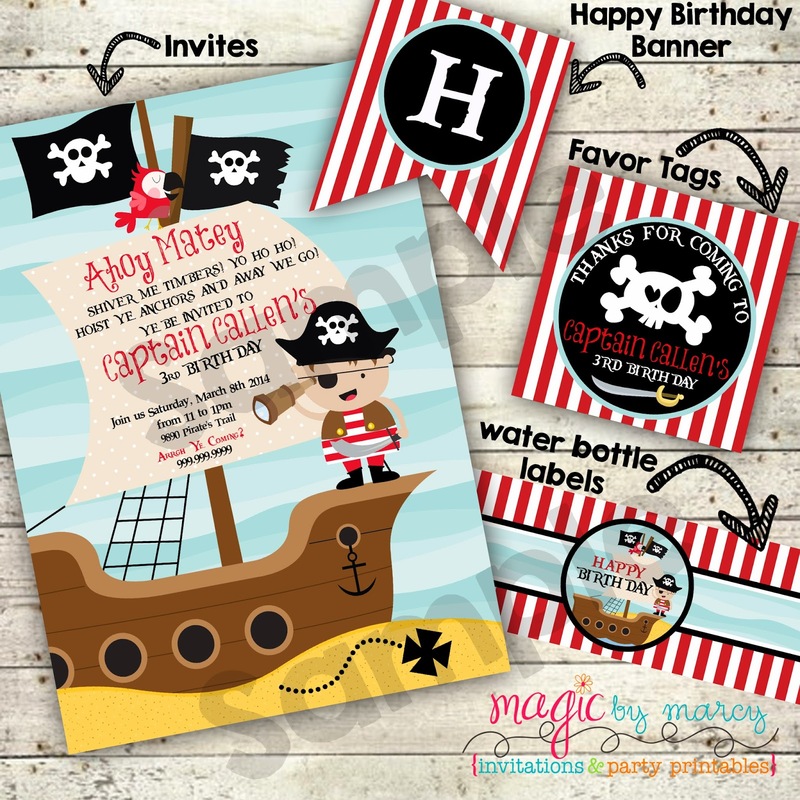 My latest Party kit is just perfect for a pirate party. 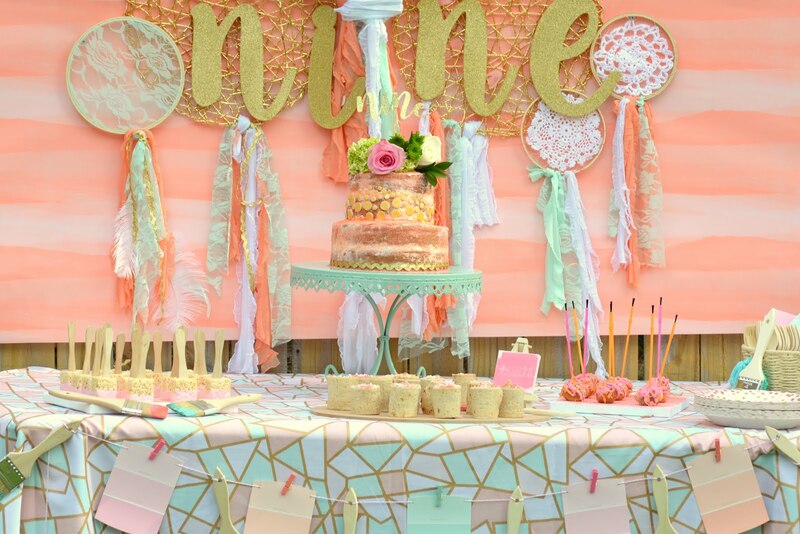 All designs are emailed within 48 hours so even if you are looking for some last minute decor for your party it is a great time saving option. For favors I found the cutest pirate hats and swords at Target. 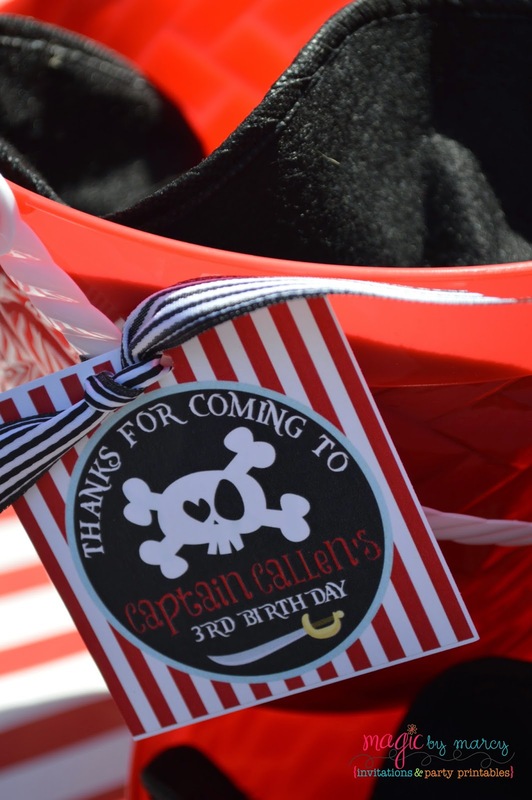 They were very inexpensive, I added a few pirate tattoos and eye patch and put it all in a bucket from Party City. Instant Pirate outfits for our little mateys. 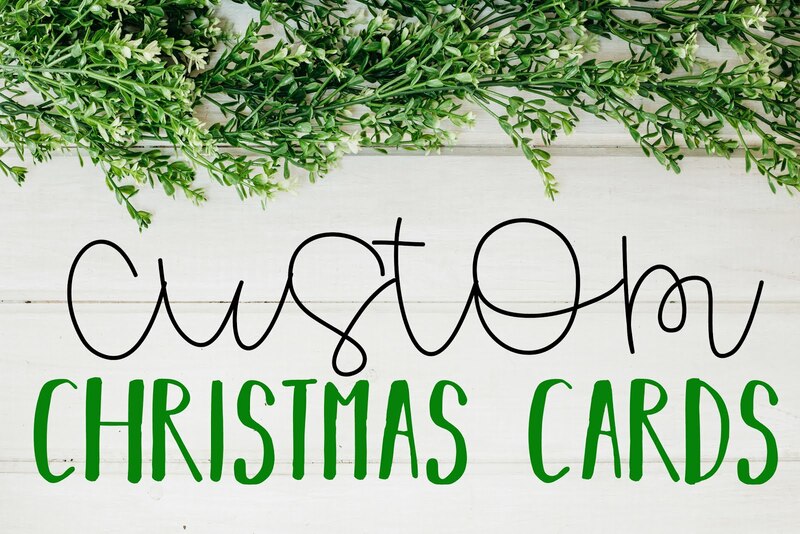 Just add a custom favor tag with some striped ribbon. 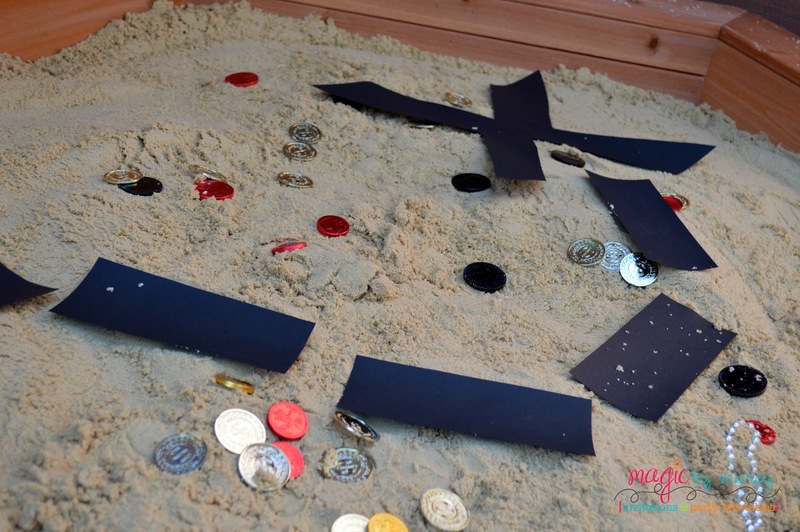 Our sons birthday present from us was a sandbox so we used it to bury a little pirate treasure ( some beads and coins) the little pirates had a great time finding their treasure and loading up their buckets. His water table (a birthday gift from his grandma) made for some instant playtime fun. The kids had a blast in the sand and water. The little Pirates got a chance to walk the plank! 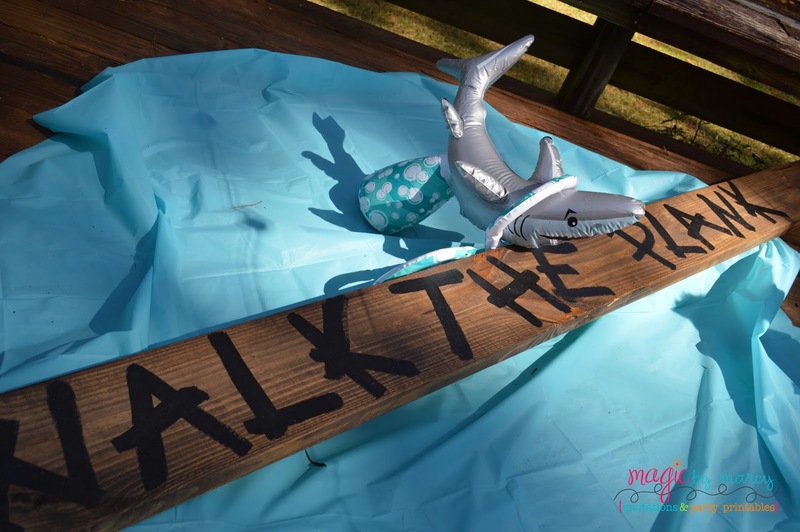 I bought a piece of wood from home depot, added a little dark stain and then painted the words walk the plank using craft paint. I used a blue table cloth underneath to act as water and added a plastic shark, the pirates enjoyed a few sword fights on the plank! For food I gathered a few ideas from Pinterest, you can view my board HERE. 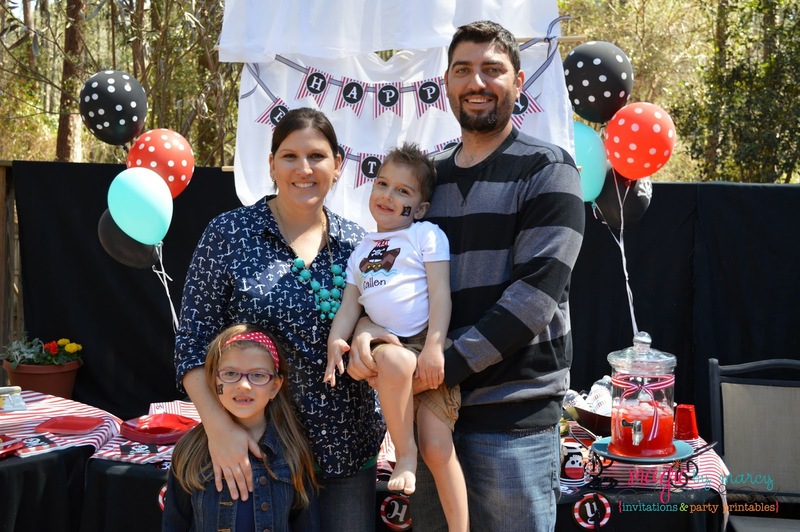 The crowd favorite were the cannon balls ( sweet and sour meatballs) super simple and easy to make in the crock pot, the kids used the swords to pick them up and they were an instant crowd favorite. The PB&J Fish & Chips were also a hit, each one was served in a little bread loaf box I found at Homegoods. a simple way to serve individual portions. We enjoyed some Rum ( Hawaiian Punch). 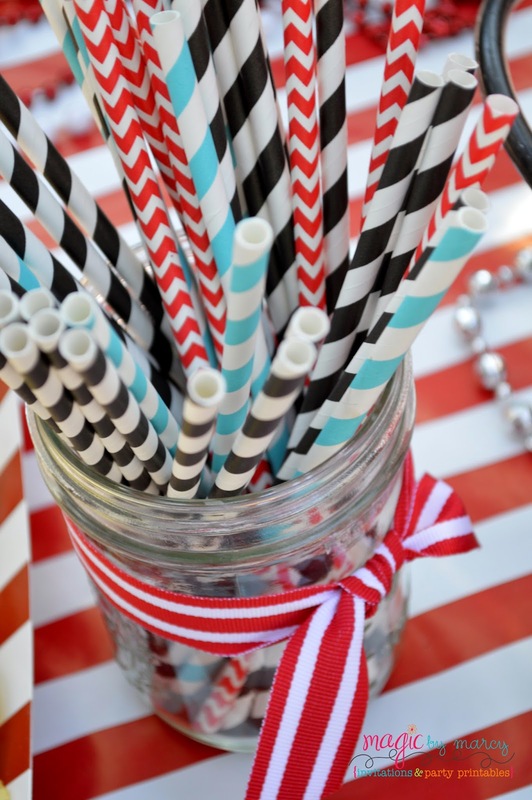 You can find paper straws almost anywhere these days I picked up a few at Target and Hobby Lobby, just add to a simple mason jar with a ribbon for easy use. 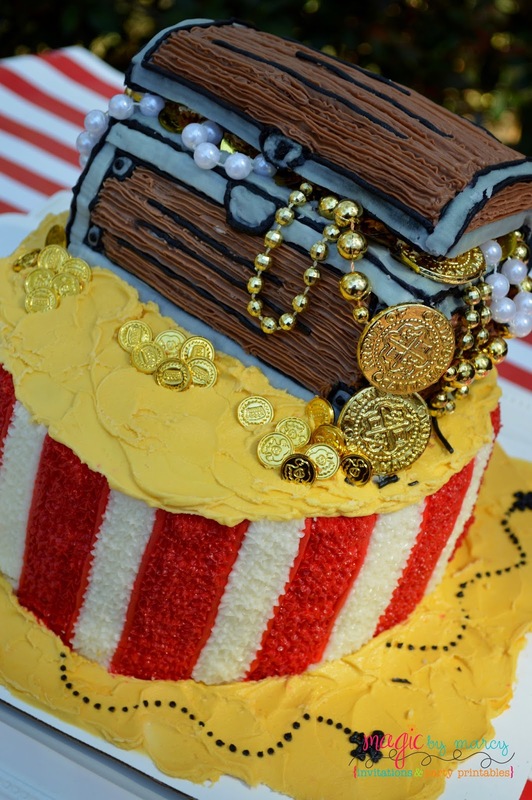 The Birthday boy loved his treasure box cake, we utilized a local cake baker, can you believe that this cake was only $20! 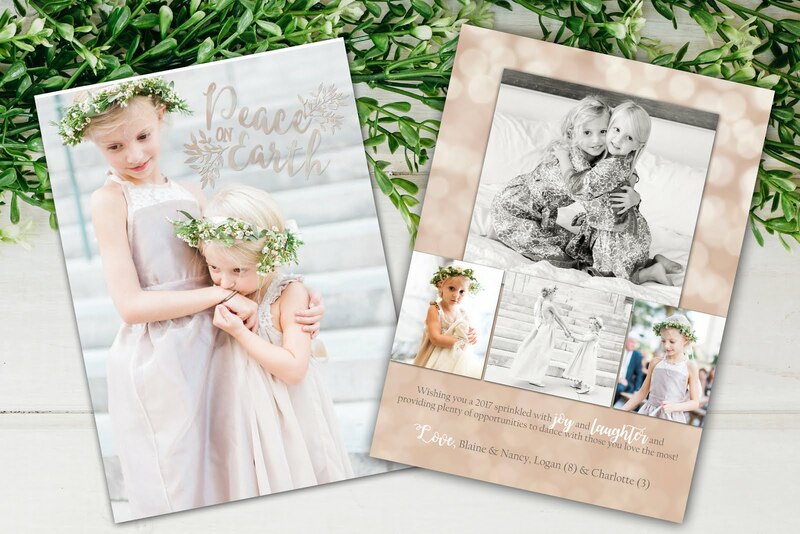 She is an amazing artist that is for sure! 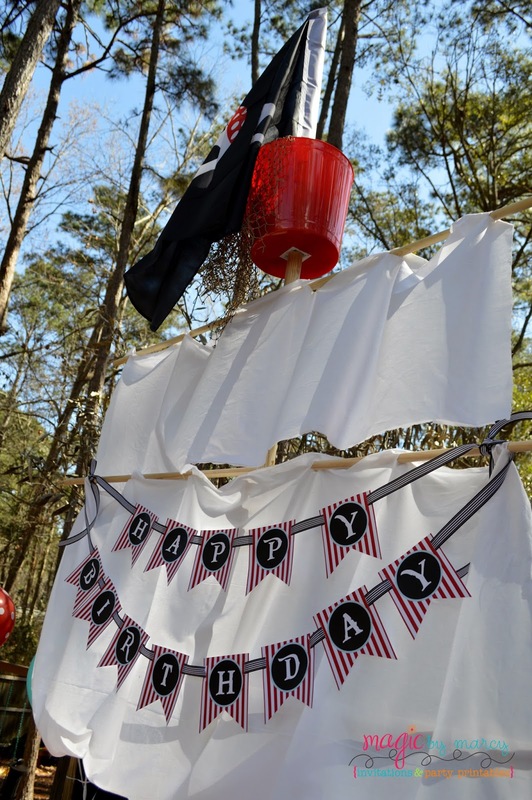 The printable kit from my ETSY shop also includes a Happy Birthday Banner and water bottle labels. For the banner just cut slits on each side and string ribbon through to hang. 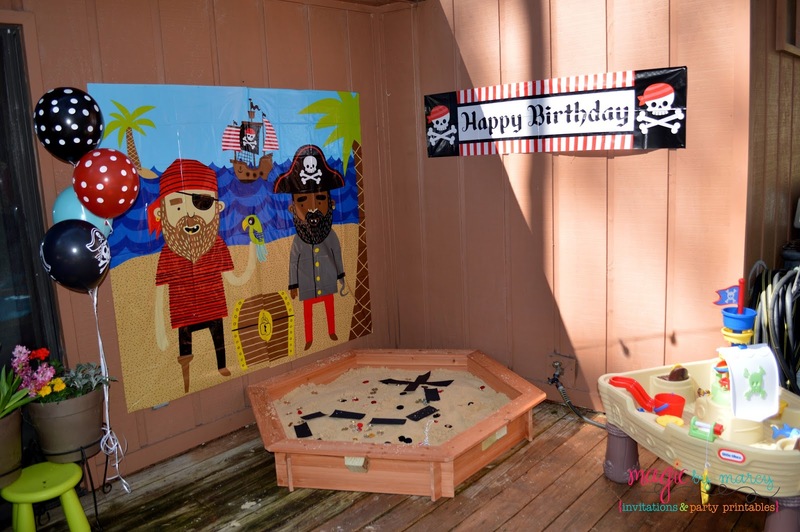 My husband helped me create the Pirate sail for the food table it was such an easy project and my son's reaction to it was priceless. Just purchase 3 dowels, drill a hole and slide the smaller ones through. I cut slits into the fabric and threaded it onto the dowel like a curtain. At the top we drilled a hole in a bucket from the $1 store. Add a pirate flag and Viola! instant Pirate Ship! 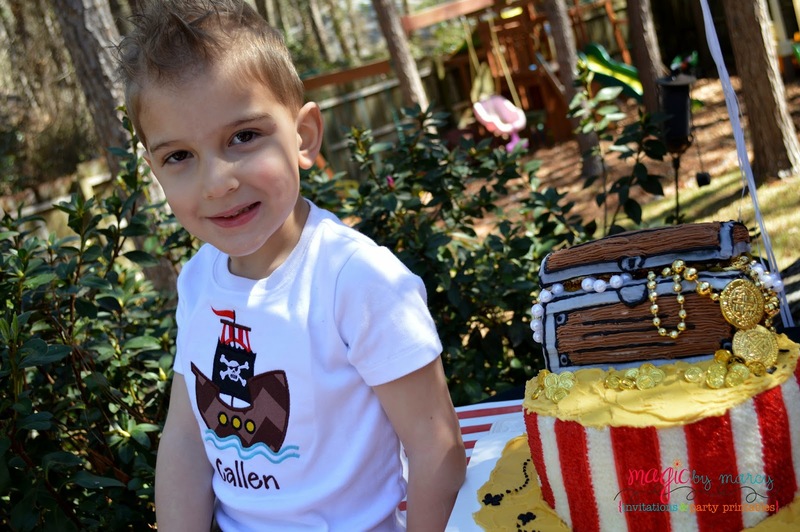 My son had a 3rd Birthday party that was exactly what he was dreaming of, fun with his friends and a pirate adventure that he won't soon forget!